I'm most grateful to the organisers for inviting me to the tenth annual BCRP-RBWC conference in Peru and it is I believe the eighth time I gratefully attend. In my remarks I will focus on the session title to respond to the question: Should central banks issue digital currencies or CBDCs? My answer is an unambiguous yes. Physical cash is simply no longer the best technology to make available means of payment widely. The gains from greater monetary control, transparency in payments and scope for financial inclusion should in my view by far outweigh possible disadvantages of CBDCs. However, those gains remain highly contested. I shall focus on the seldom evoked but important special role CBDCs can play to advance financial inclusion. CBDCs are digital representations of physical cash. By CBDCs I mean here only general purpose CBDCs that are available to the general public including for retail transactions. Central bank currency for non-banks is currently mostly only available in the form of physical notes and coins. Only to clarify, CBDCs differ in most respects from cryptocurrencies issued by private entities. To further clarify, payments by debit card, PayPal, M-Pesa or AliPay are commercial bank transactions that offer digital payments solutions but do not involve central bank money. Cash has many advantages. It is legal tender, it allows instantaneous settlement of debt, does not involve any counterparty risk, does not require parties to trust one another, access is permission-less, the cash payment infrastructure is highly decentralised and cannot be corrupted and cash transactions can be anonymous. The considerations for some digital replacement of cash have of course been debated for some time.1 It has been motivated in large part by the proliferation of non-cash transactions. However, the explicit role of CBDCs for financial inclusion has been largely discarded.2 This may deter from the significant social benefits CBDCs may offer. While financial inclusion is obviously normally not an issue in high income economies, it is very much an issue in lower income ones. The case for CBDC to advance financial inclusion is based on the assumption that the non-bank public wants access to central bank money, that is something with true cash properties including for example finality in settlement.3 It rests further on the simple observation that money can be stored far more safely on mobile phones, that there are far more mobile phone subscriptions than bank accounts and that there is a priori no reason why central banks should discharge responsibility to distribute cash to third parties when better channels of distribution exist. Cash access is limited in lower income countries. In countries with a GDP per capita greater than US$20,000, 94 percent of adults hold a bank account. 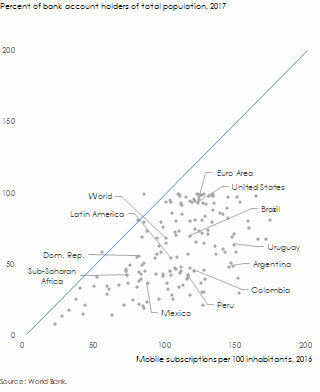 In countries with a GDP per capital of less than US$5,000 and more than US$1,000 44 percent hold a bank account and in countries with a GDP per capita of less than US$1,000 32 percent hold a bank account. In Latin America and the Caribbean, 52 percent of adults hold bank accounts. 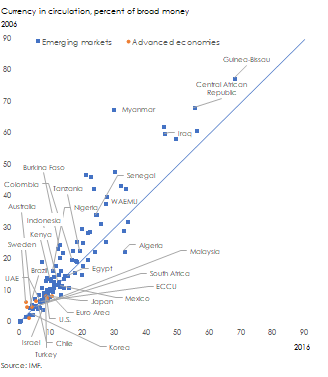 Access to cash is also constrained in emerging markets by the lower number of ATMs and commercial bank branches per unit of population representing 24 percent and 43 percent, respectively, of the number in advanced economies. In comparison, mobile phone subscriptions are plenty. Upper middle income and high income countries have 133, middle income countries 96 and low income countries 64 mobile phone subscriptions per 100 inhabitants. In Latin America and the Caribbean there are 114 mobile phone subscriptions per 100 inhabitants. The discrepancy between cash and mobile phone access should offer the possibility to make CBDCs available through mobile phone-based technology and thereby facilitate far broader access to simple financial services than afforded by weak bank account penetration (Figure 2). Central banks have for some time left the distribution of cash or maintenance of cash supply to third parties. They offer only primary wholesale services with retail services being provided by bank, non-bank financial and corporate entities including at times special cash supply contractors. Central banks normally also do not hold accounts with the non-bank public.5 The division of labour may make sense as the distribution of physical cash represents an enormous task. However, the distribution of CBDC would be far easier. Existing technologies today suggest that central banks do no longer need to rely on others to maintain an efficient cash cycle. The adoption of CBDCs remains controversial in particular amid concerns about financial stability and to a lesser extent for monetary policy implementation.6 The central bank would have to offer accounts or electronic wallets to the non-bank public. This has mostly raised concerns that in the event of bank distress, the public would instantaneously convert its bank deposits into central bank money. Given that past banking crises have caused only a relatively modest increase in physical cash holdings, it rests on the assumption that the reduction in transaction costs for converting bank deposits changes radically the public’s preference for holding cash. The case of the Central Bank of Ecuador shows that setting up a CBDC is complicated. The central bank introduced an electronic money service in 2015 but closed the service in April of this year amid insufficient demand. The feeble adoption of the CBDC has been attributed to persistent uncertainty about its legal framework. Legal certainty is essential to make CBDC exhibit cash-like properties. The non-bank public needs to be assured that CBDC is real central bank money and no substitute for bank liabilities. The choice of CBDC technology is critical to replicate essential cash attributes. Key cash advantages like its highly decentralised payments infrastructure will be difficult to replicate. Anonymity may be desirable to make conditional only. Finality in settlement will be critical. The actual CBDC design will naturally determine adoption and there will be important trade-offs between cash and CBDCs. To conclude, CBDC offers the opportunity to spearhead financial inclusion. In emerging markets, the low incidence of bank accounts indicates that the banking channel does not offer the best possible approach to distribute means of payments widely and safely. Mobile phone operators have been successful to partially substitute or supersede banks. Yet, if access to central bank money for the non-bank public matters, existing mobile technologies seem to offer a direct approach for central banks to maintain an efficient cash cycle and advance more equitable access to central bank money. Central banks therefore need to focus more on financial inclusion for the assessment of introducing CBDCs. 1 For an overview of the debate see e.g. Kenneth Rogoff, The curse of cash, Princeton, NJ, Princeton University Press, 2016. 2 The Bank for International Settlements (BIS) indicates broadly that CBDC could improve financial inclusion in some countries while warning that CBDC does not necessarily alleviate all constraints of access (BIS, Central bank digital currencies, March 2018). The Financial Stability Board (FSB) warned that CBDC would be an “entry into unchartered territory” (FSB, Crypto-assets, Report to the G20 on work by the FSB and standard-setting bodies, 16 July 2018). Pereira highlights the potential of digital currencies but makes not reference to CBDC (Luiz Awazu Pereira da Silva, Fintech in EMEs: blessing or curse, panel remarks at CV Meeting of central banks governors of CEMLA, 5 June 2018). Engert and Fung indicate that CBDC could provide an accessible general purpose electronic payment methods but refer to Modelo in Peru and M-Pesa in Kenya as alternatives without reliance on CBDC (Walter Engert and Ben Fung, Central bank digital currency: Motivations and implications, Staff Discussion Paper, Bank of Canada, November 2017). Díaz and Conde highlight the Modelo Perú explicitly as a vehicle to advance financial inclusion (Pablo Diaz and Tomás Conde, Model Peru, Center for Financial Inclusion, January 2017). The role of the Modelo Perú has been described to me by the Peruvian authorities as a payments platform only and no as a digital currency. 3 The debate around the failed Swiss Sovereign Money Initiative (Vollgeld) referendum of 10 June 2018 offers interesting elements on the importance of central bank money (https://www.vollgeld-initiative.ch/). 4 On the recent expansion of cash, see e.g. Daniel Gros, Implications of the expanding use of cash for monetary policy, CEPS Policy Insights, June 2017. Bech et al show that cash demand increased since 2007 attributed largely to advanced economies since 2007 using a sample of 46 countries and measure of cash relative to GDP (Bech et al, Payment are a-changin’ but cash still rules, BIS Quarterly Review, March 2018). For an argument in favour of cash, see e.g. Yves Mersch, Why Europe still needs cash, Project Syndicate 28 April 2017. 5 On the cash cycle, see e.g. Miika Syrjänen and Kari Takala, The role of the central bank in the cash cycle, Bank of Finland Bulletin, 27 May 2010. 6 See e.g. Barry Eichengreen on CBDC at CNBC on 30 October 2017 (https://www.cnbc.com/2017/10/30/barry-eichengreen-central-bank-digital-currency-not-cryptocurrency.html) and Ben Dyson and Grapham Hodgson, Digital cash why central banks should start issuing electronic money, Positive Money, January 2016. On the relationship between CBDC and monetary policy, see e.g. Michael Bordo and Andrew Levin, Central bank digital currency and the future of monetary policy, Hoover Institution, Economics Working Paper, August 2017. Listen e.g. to the media conference of Benoît Coeuré and Jacqueline Loh of 12 March 2018 (https://www.bis.org/cpmi/publ/d174.htm) on the BIS study Central bank digital currencies; Coeuré in his opening remarks indicated that the benefits from general purpose CBDCs are “quite limited” as private solutions already exist; Loh answers that “physical cash made available through banks served us well and sets a high barrier for change but where cash is in disappearing there may be stronger reasons to consider CBDC” highlighting in particular the financial stability risk due to conversion of bank deposits into CBDC. See also the e-krona project (Central Bank of Sweden, The Riksbank’s e-krona project, report 1, September 2017).